Three very engaging movies in one box! These movies help satisfy a man's need for some action and suspense. All three raked in a lot of money at the box office. Expect nothing less from our main man Mel Gibson. 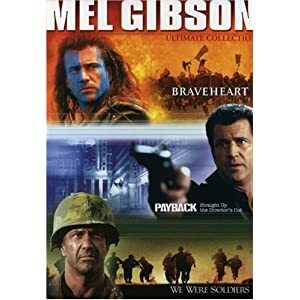 The first movie in this box is Braveheart, a tale about a Scottish revolutionary leader named William Wallace. Wallace leads the Scots in a revolt against the English to fight for the country's independence. We Were Soldiers is about the very first engagement between American Soldiers and the Vietnamese during the Vietnam War. This is where 400 inexperienced soldiers stood up and became heroes against 2,000 angry enemies! We always love movies about overcoming incredible odds, and this is definitely one of those movies. In Payback, Mel Gibson portrays a criminal named Porter. He was betrayed by his fellow thugs - they shot him and took off with his $70,000 cut! He recovers and comes back for his fair share, and some serious revenge. These are excellent movies. As a set, this makes a wonderful present for a man.